Welcome to our 2018 Runner Bean growth measurement chart. Each year we grow Runner Beans (and many other vegetables) in our garden. When it comes to Runner Beans we plan the seeds around Easter time and in support of KS1 learning about measurements we track germination time and rate of growth, capturing the detail on this page of our blog. Sunday, April 8th, 2018: We planted runner bean seeds in small pots full of moist potting compost and then sealed these in plastic bags. We placed these on the kitchen windowsill so that they would get some warmth from the sun and not fall below approximately 15 degrees centigrade. Monday, April 16th, 2018: Overnight the first of our Runner Beans has germinated and sprouted above the potting compost. As of 17:45 the plant measures 11cms tall from the base of the pot to the top of the plant. 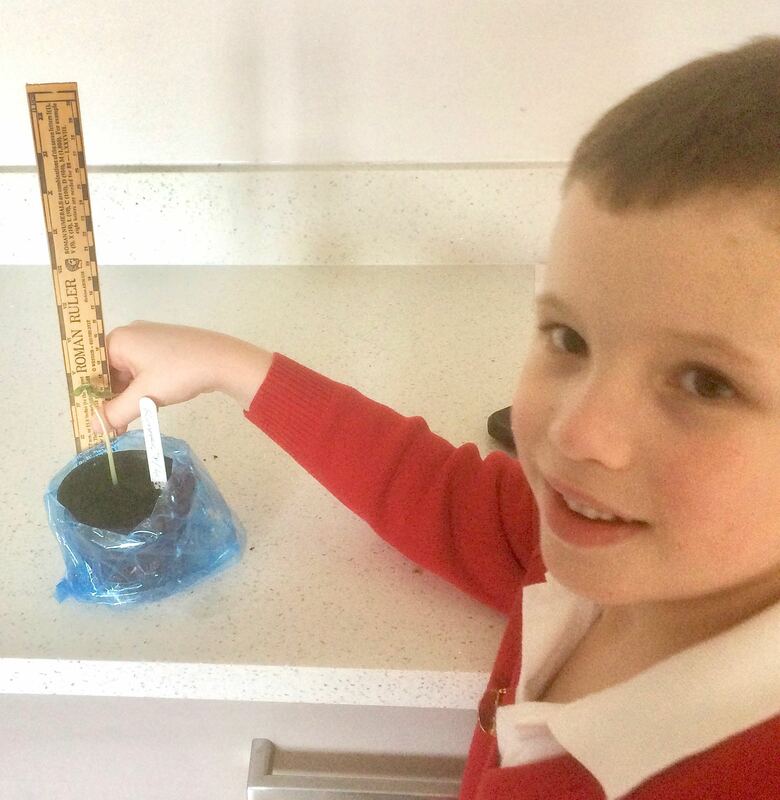 Tuesday, April 17th, 2018: Today the runner bean has almost doubled in size and now measures 19cms. Wednesday, April 18th, 2018: Today the runner bean has reached 29cms. It’s been a lovely warm bright day reaching in excess of 25C on the windowsill where we are keeping these plants. We’ll keep it indoors until the weekend and then move it to the unheated greenhouse to start hardening off. Sunday, June 17th, 2018 (Fathers Day) – The runner bean is now back to 79cms. A couple of weeks ago the farmer next door sprayed his crop with something and this seemed to really affect the runner beans in our garden. They seem to be recovering now. We’ve planted a few spare runner beans which are now looking very healthy and we’ll plant them out in another part of the garden next weekend.